Jatarie White has found Texas a great fit. Photo courtesy of Texas Athletics. During the third quarter in a game against Georgia on Dec. 3, the Texas junior transfer center caught the ball on the right elbow, her back facing the basket. The 6-foot-4-inch post squared up to the rim, bounced the ball once to move to the left side of the lane and again as she pivoted to the center of the paint. Caliya Robinson, a starting 6-foot-3-inch junior forward for Georgia and 2016-17 SEC All-Defensive Team member, stuck to White’s hip the entire way. White dug in her bag of tricks to give her smothering opponent the slip. She pump faked the ball over head, sending Robinson in the air, then glided to the rim, kissing the ball off the backboard with her left hand for two points. It was the up and under, White’s go-to move. White’s been fooling defenders like that since high school. She’s feinted and scooped her way to a starting spot on a Texas team that earned a No. 2-seed in the 2018 NCAA tournament. It’s taken three years for her to step foot on the Frank Erwin Center hardwood. A native of Charlotte, North Carolina, she helped lead Providence Day to four state championships. In her senior year, White averaged 21.4 points and 8.7 rebounds per game and was rated as the nation’s top post prospect and the No. 7 overall recruit. She drew interest from North Carolina, Tennessee, Ohio State and Texas, among others, but committed to South Carolina in Nov. 2013. White was a major acquisition for the Gamecocks, but South Carolina still had their eyes on another target: 6-foot-5-inch, No. 1 overall recruit A’ja Wilson. There was no guarantee Wilson would sign with the team. She’d been recruited by the best schools in the nation, including UConn, and took an extra five months to reach a decision. Wilson committed to South Carolina in April 2014, the final piece of the No. 2 recruiting class that year.that also featured White and a trio of guards. Wilson’s arrival buried White on the depth chart. 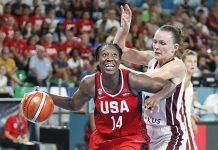 During White’s freshman year, the Gamecocks returned two perennial starters at the post spots in seniors Elem Ibiam and Aleighsa Welch and brought 2013-14 SEC Freshman of the Year and sophomore center Alaina Coates off of the bench. Still, White wasn’t left completely out of the game plan. 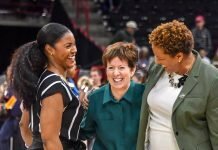 “The way that Dawn Staley substitutes, she knew that anybody, Jatarie White included, was going to get some chances,” Cloninger said. White played sparingly in the early part of the season and began to carve out her role with the team. But in early Dec. 2014, White suffered a stress fracture in her foot that left her sidelined for a month. White’s injury left her falling behind. It took a while for White to earn her spot minutes back, and took even longer when she missed another three games in February with an illness. But heading into her sophomore season, she was bound to see her playing time increase. Ibiam and Welch graduated and Coates and Wilson were next in line to replace them in the starting lineup. White was supposed to be the definitive second-unit post. She struggled with the extra responsibilities and after another setback with her foot injury, she saw her minutes cut again. White played her last game for South Carolina on March 25, 2016 in an 80-72 loss against Syracuse in the Round of 16 of the NCAA tournament. Her only stat of the night was committing a turnover in just two minutes of action. In two seasons for the Gamecocks, White missed 18 games while averaging 2.7 points and 2.6 rebounds. She made a Final Four appearance and won two SEC Conference Championships, but wanted more from her college experience. White’s self-confidence plummeted. Frustrated, she realized she had to get out of Columbia. 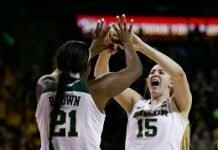 White announced her decision to transfer on March 31. She was eager to find a team that would be better equipped to support her emotionally. One school stood out fairly early in the process. Monica White, Jatarie’s mother, had always wanted her daughter on the 40 Acres. When Jatarie took her first visit to Austin as a senior in high school, Monica told her that Texas should be her first choice. Jatarie chose South Carolina instead to be closer to home, but Monica’s love for the Longhorns never deterred. 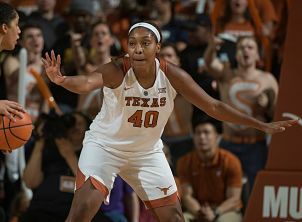 White took her second visit to Texas in June 2016 and reconnected with head coach Karen Aston and senior guards Ariel Atkins and Brooke McCarty. The three had pushed hard to sign her in 2014 and bombarded White with texts, calls and FaceTimes to ensure their second opportunity didn’t go to waste. It worked. White committed to Texas on June 7, 2016 and began playing the waiting game. Under current NCAA rules, save for some exceptions, student athletes who play baseball, men’s or women’s basketball, FBS football or men’s ice hockey must sit out of athletic competition for one year after transferring. Student athletes from other sports are not subject to this rule and face far fewer restrictions when transferring. Coaches frequently switch schools with ease, even while under contract. This has raised concerns that student athletes subject to the transfer rule are comparatively treated unfairly. To pacify those concerns, the NCAA considered a rule change earlier in 2017 in which student athletes meeting unstated academic standards would be eligible to play immediately upon transferring to a new school. The proposal received a lot of pushback. During her season off, White was able to do everything a typical student athlete does — except play in a game. She took the year to build her confidence back up, putting in extra work to improve her strength and conditioning and improve her focus on academics. It wasn’t easy, though. White felt like she could have made a bigger impact. White has settled in nicely to her new home. She started in 26 games this season and is averaged 10.6 points and 5.7 rebounds in 21.6 minutes per game. Heading into the Longhorns’ matchup with No. 15-seed Maine on Saturday, she’s now trying to accomplish what South Carolina did, and what Texas couldn’t do, without her.